On Friday, Feb. 8, 2019, Elizabeth Ellen Sandland, owner and operator of Long Hill Assisted Living Facility of Edgartown, mother of two children, died at the age of 75. Elizabeth was born on April 16, 1943, in Birmingham, England, to Leslie and Edith Sandland. 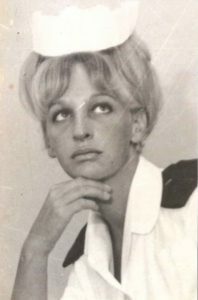 She received her nursing degree from the Queen Elizabeth School of Nursing in 1963, and practiced all over the world; in England, the West Indies, California, and Manhattan. She arrived on Martha’s Vineyard in 1985, and soon after began her mission; she opened an assisted living facility where she cared for our parents and relatives for almost 30 years. At Long Hill in Edgartown, her second assisted living facility after Brookside in West Tisbury, she selflessly provided a loving and safe space where dignity, grace, and comfort were in abundance. Elizabeth was preceded in death by her father Leslie and her mother Edith. She is survived by her three brothers, Chris, Stephen, and Paul; her sister Mary; and her two sons, Jackson and Daniel. Her funeral will be held at Grace Episcopal Church in Vineyard Haven on Saturday, Feb. 16, from 10 to 11 am. A celebration of her life will be held at Long Hill at 3 Long Hill Rd. in Edgartown from 2 to 5 pm on the day of the funeral. Everyone in the community, and anyone whose life she’s touched is invited. There will be a live band, food, and drinks. She requested that this be a celebration of her life, and in no way morose. She wants us to continue her joyful legacy. For online guestbook and directions, please visit ccgfuneralhome.com. The post Elizabeth Ellen Sandland appeared first on The Martha’s Vineyard Times.